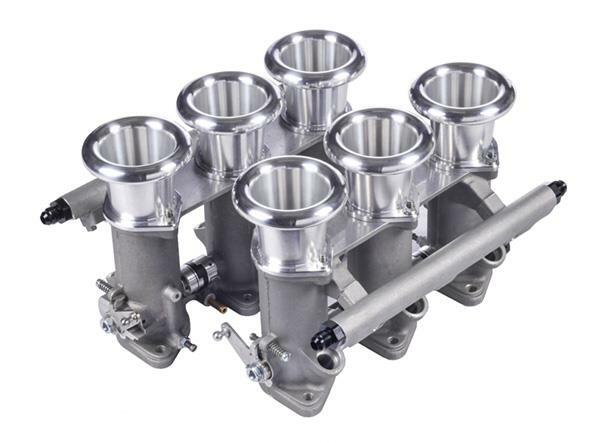 Now sold in complete kits with air horns (velocity stacks), fuel rails, and linkage. Borla Induction 3003 Series units are a direct replacement for downdraft IDA 3C carburetors as fitted to early Porsche 911, Ferrari 512 and Lamborghini models. The barrel centers are at 94 mm and the overall height is 123.5 mm. The manifold mounting flange is identical to the flange on the Weber IDA 3C. The air filter flange differs from the carburetor in that it uses 6 mm studs which are 1 mm further apart than the carburetor. Each barrel has an air by-pass screw. MAP sensor ports are provided on both units. 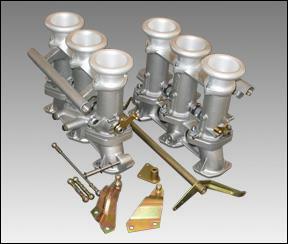 There are integral mounts for the fuel rail which is supplied with the unit. AN-6 threads are in each end of the rail for which a specific fitting, part number 206138, is available. The right hand unit incorporates a shaft with a single 5/16 " D-drive and mounting pad for Borla Induction and other throttle position sensors. Please note the 3003 Series is the only Borla Induction throttle body where 'left' does not indicate the switch drive unit.